Will Racist, Anti-Immigrant Trump Supporter Sheriff Joe Arpaio Be Jailed for Contempt of Court? | Democracy Now! executive director of Puente Arizona, a grassroots human rights movement for migrant justice. In Arizona, Maricopa County Sheriff Joe Arpaio faces the possibility of jail time, after federal prosecutors announced they are charging Arpaio for criminal contempt of court over his refusal to end unconstitutional immigration patrols in Arizona. Arpaio has long been under fire for his immigration policies, which have included racial profiling and detaining immigrants in a scorching outdoor Tent City jail, which Arpaio once referred to as his own “concentration camp.” Arpaio has also been a key supporter of Donald Trump, appearing at rallies alongside the Republican presidential candidate, and where he’s joked that both he and Trump have been key members in the “birther” movement, which refuses to acknowledge President Obama was born in the United States. Arpaio now faces up to six months in jail if he’s convicted on contempt of court charges. Activists are also organizing for him to be voted out of office in this November’s election. We speak to Carlos García, executive director of Puente Arizona, a grassroots human rights movement for migrant justice. JUAN GONZÁLEZ: In Arizona, Maricopa County Sheriff Joe Arpaio is facing the possibility of jail time, after federal prosecutors announced that they are charging him for criminal contempt of court over his refusal to end unconstitutional immigration patrols in Arizona. Arpaio has long been under fire for his immigration policies, which have included racial profiling, detaining immigrants in a scorching outdoor Tent City jail that Arpaio once referred to as his own “concentration camp.” Arpaio has also been a key supporter of Donald Trump, appearing at rallies alongside the Republican presidential candidate and where he’s joked that both he and Trump have been key members in the birthers movement, which refuses to acknowledge President Obama was born in the United States. AMY GOODMAN: Sheriff Arpaio now faces up to six months in jail if he’s convicted on these contempt of court charges. Activists are also organizing for him to be voted out of office in November’s election. We’re going now directly to Phoenix, where we’re joined by Carlos García, executive director of Puente Arizona, a grassroots human rights movement for migrant justice. Can you talk about this latest case, why Sheriff Arpaio faces these contempt of court charges, criminal contempt of court, Carlos? CARLOS GARCÍA: To understand the case, you must first understand what Sheriff Arpaio was doing in our communities. In 2007, he obtained the 287(g) agreement and decided to go after our communities in a way that was never seen before—what he called crime suppression sweeps. He flooded immigrant neighborhoods with his deputized posse members, plus his sheriff deputies, and would pull over and detain anyone that looked undocumented, resulting in cases like—I remember we would go out there and film, and we saw a sheriff who had toys in his trunk, knowing that day that he would take or maybe be separating a family. He had toys in order to give to children as they were waiting for their parents to be picked up. In those conditions, the [Ortega Melendres] lawsuit was filed, and, you know, several years later, was found guilty of racial profiling and was asked to stop racial profiling and stop the practices that the MCSO, the Sheriff’s Office, was pertaining to. And so, what happened is Sheriff Arpaio, being Sheriff Arpaio, ignored the law, ignored the judge’s order, and ordered his officers to continue to racially profile and do what they were doing, resulting in this contempt of court, where he now faces a criminal conviction. And his trial is set for December 6th. JUAN GONZÁLEZ: And, Carlos, why has the sheriff continually, despite all of this furor nationwide over his policies and many of the changes that have occurred in the Arizona political establishment after SB 1070—why he has continued to be re-elected to office? 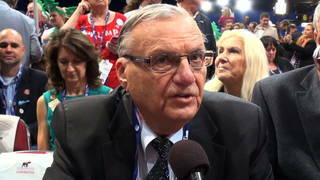 CARLOS GARCÍA: Sheriff Arpaio is running for the seventh time. He’s been in office for 24 years. It’s unexplainable. It’s not only our community he’s gone after, but, as you mentioned, has Tent City, has spent millions and millions of taxpayer money. We’ve had over 150 people die in his jails. His abuse, his racial profiling has been documented. And the Department of Justice, who’s now in charge of prosecuting this case, put out a report in 2009 that it’s the worst case of racial profiling abuse they had ever seen. And so, in—here in Maricopa County, unfortunately, in Phoenix, we have two communities. We have a community of—a growing community of migrant peoples, and then a community of retired folks who really appreciate what Sheriff Arpaio is doing. And so, I think we’ve come to a place where that’s shifting. And hopefully, in—and in this growing movement, and specifically on October 27th—October 22nd, we’re going to have people from across the country join us in this historic election and, hopefully, finally get rid of Sheriff Arpaio. As the wheels of justice continue to turn as slow as they’ve been turning, it’s up to the people here in Maricopa County to make sure that Sheriff Arpaio is gone. AMY GOODMAN: The case that could land him in jail, Ortega Melendres, that you were talking about, who is Ortega Melendres? CARLOS GARCÍA: Ortega Melendres is a person that was actually here in Maricopa County on a tourist visa. And while Sheriff Arpaio was doing these crime-suppression patrols, they pulled someone over. It was actually citizen driver, and Ortega Melendres was sitting next to him, and that person was asked for their documents, booked. And like Ortega Melendres, there’s been thousands of people who have been racially profiled, detained unfairly, detained and put through this process. And now that a federal court has found Arpaio guilty of not only racially profiling, but then disobeying the order to stop. JUAN GONZÁLEZ: There was also—wasn’t there?—a major corruption scandal in Arpaio’s office that led to the dismissal of several of his key deputies. What happened with that? CARLOS GARCÍA: I mean, it’s a long history. There’s been over 3,000 lawsuits that Arpaio has been under. His deputies have turned on him. Yesterday in court, some of his deputies and also his attorney were also in court, who were also facing criminal charges for following through with this. But one thing I do want to note, that seeing Sheriff Arpaio, an older man, in jail or him being arrested is not the end game for us. I think what’s been the most harmful is the culture and policies that he’s brought not only to Arizona, but pushed across the country. And so, for us, it’s not only arresting Arpaio, but it’s arresting the unjust system that he’s brought forth and the fear and trauma he’s brought to our community. AMY GOODMAN: We want to thank you so much, Carlos García, for rejoining us, executive director of Puente Arizona, a grassroots human rights movement for migrant justice. We will certainly follow this case, Ortega Melendres, et al. v. Arpaio, which could land the sheriff of Maricopa County in jail. This is Democracy Now!, democracynow.org, The War and Peace Report. I’m Amy Goodman, with Juan González.